The current﻿ ​Rule of the Secular Franciscan Order (see below) is the third Rule that the OFS has had over the past 800 years. This Rule was approved and confirmed in 1978 by Pope Paul VI and the four Ministers General of the Franciscan family. It consists of a prologue (two letters of St. Francis) and three chapters. The first chapter "details the place of the Secular Franciscan Order in the Church, in the Franciscan Family, and in the history of the Order itself". 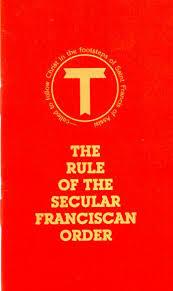 The second chapter of the Rule provides "a thorough and detailed description of the Secular Franciscan way of life." The third and final chapter of the Rule addresses the topic of fraternity, the active and living community that provides a framework for Secular Franciscans to live out their vocation. The two letters of the Prologue are exhortations addressed from St. Francis to the Brothers and Sisters. CIOFS has prepared a 12-minute video, entitled, “Forty years of the ‘New' Rule, A Treasure for the OFS" which provides a historical perspective on the rule of 1978 and a beautiful summary. Translation approved by the Franciscan General Ministers in their meeting of March 19, 1979. We joyfully inform you that the Holy See, by means of the Apostolic Letter Seraphicus Patriarcha, dated 24 June, 1978 and “under the ring of the Fisherman,” has approved the revised Rule of the Franciscan Secular Order which abrogates and takes the place of the preceding Rule of Pope Leo XIII. It is to Pope Paul VI that we owe this splendid gift, which he bestowed shortly before he left this earth. He loved you. Many times, indeed, he demonstrated his love for the Secular Franciscan Order and addressed to you unforgettable words, as in June of 1968 and in 1971 on the occasion of the 750th anniversary of Memoriale Propositi. Since March 7, 1966, when the Sacred Congregation for Religious granted permission to begin updating legislation for the Secular Franciscan Order, the journey has been long and arduous. We wish to underscore the work accomplished by the brothers and sisters and by the fraternities through the National Councils, through such publications as Way of Life and Journeys, and by the tireless work of the Presidency of the International Council since its establishment in 1973. Such work was of primary importance in seeking the ways of the Spirit and most efficacious in recognising the presence and the vitality of the Franciscan charism in the people of God in our day. The Rule that we present to you today is not only the fruit of this labour. The Church consigns it to you as a norm of life. Notice first its evangelical content; welcome the Franciscan message that it contains and the guidance it offers you in living according to the holy Gospel. The hope of renewal hinges upon returning to the origins and to the spiritual experience of Francis of Assisi and of the brothers and sisters of penance who received from him their inspiration and guidance. It is this that accounts for the inclusion of the Letter to the Faithful (recensio prior) as a prologue, as well as the constant references to the teaching and example of St. Francis. This renewal also depends upon openness to the Spirit in the signs of the times. Supported by this foundation, you should put into practice the invitation of the Rule to be creative and exercise co-responsibility. We, the Franciscan Ministers, with all our Friars are ever ready and open to offer you all our assistance so that we may walk together in the way of the Lord. With these sentiments we are pleased to present the revised Rule of the Secular Franciscan Order to the Presidency of the International Council and through this Council to all secular Franciscans who will receive it as a norm of life. Fr. Constantine Koser, OFM, Min. Gen.
Fr. Vitale M. Bonmmarco, OFMConv., Min. Gen. Fr. Paschal Rywalski, OFMCap., Min. Gen.
Fr. Roland Faley, TOR, Min. Gen.
By this Letter and our apostolic authority, we abrogate the previous Rule of what was formerly called the Franciscan Third Order. Finally we decree that this letter remain in effect now and in the future, regardless of anything contrary. Given at Rome at St. Peter’s, under the ring of the Fisherman, on June 24, 1978, the 16th year of our pontificate. John Cardinal Villot Secretary of State. All who love the Lord with their whole heart, with their whole soul and mind, with all their strength (cf. Mk. 12,30), and love their neighbours as themselves (cf. Mt. 22,39) and hate their bodies with their vices and sins, and receive the Body and Blood of our Lord Jesus Christ, and produce worthy fruits of penance. Oh, how happy and blessed are these men and women when they do these things and persevere in doing them, because “the spirit of the Lord will rest upon them” (cf. Is. 11,2) and he will make “his home and dwelling among them” (cf. Jn. 14,23), and they are the sons of the heavenly Father (cf. Mt. 5,45), whose works they do, and they are the spouses, brothers, and mothers of our Lord Jesus Christ (cf. Mt. 12,50). We are spouses, when by the Holy Spirit the faithful soul is united with our Lord Jesus Christ, we are brothers to him when we fulfil “the will of the Father who is in heaven” (Mt. 12,50). We are mothers, when we carry him in our heart and body (cf. 1 Cor. 6,20) through divine love and a pure and sincere conscience; we give birth to him through a holy life which must give light to others by example (cf. Mt. 5,15). Oh, how glorious it is to have a great and Holy Father in heaven! Oh (how glorious it is) to have such a beautiful and admirable Spouse, the Holy Paraclete. "Oh holy Father, protect them with your name (cf. Jn. 17,11) whom you gave me out of the world. They were yours and you gave them to me (Jn. 17,6). I entrusted to them the message you entrusted to me and they received it. They have known that in truth I came from you, they have believed that it was you who sent me. For these I pray, not for the world (cf. Jn. 17,9). Bless and consecrate them, and I consecrate myself for their sakes. I do not pray for them alone; I pray also for those who will believe in me through their word (cf. Jn. 17,20) that they may be holy by being one as we are (cf. Jn. 17,11). And I desire, Father, to have them in my company where I am to see this glory of mine in your kingdom (cf. Jn. 17,24; Mt. 20,21)." But all those men and women who are not doing penance and do not receive the Body and Blood of our Lord Jesus Christ and live in vices and sin and yield to evil concupiscence and to the wicked desires of the flesh, and do not observe what they have promised to the Lord, and are slaves to the world, in their bodies, by carnal desires and the anxieties and cares of this life (cf. Jn. 8,41); slaves of the devil whose sons they are and whose works they do. These are blind, because they do not see the true light, our Lord Jesus Christ; they do not have spiritual wisdom because they do not have the Son of God who is the true wisdom of the Father. Concerning them, it is said, “Their skill was swallowed up” (Ps. 107,27) and “cursed are those who turn away from your commands” (Ps. 119,21). They see and acknowledge, they know and do bad things and knowingly destroy their own souls. See, you who are blind, deceived by your enemies, the world, the flesh and the devil, for it is pleasant to the body to commit sin and it is bitter to make it serve God because all vices and sins come out and “proceed from the heart of man” as the Lord says in the Gospel (cf. Mk. 7,21). And you have nothing in this world and in the next, and you thought you would possess the vanities of this world for a long time. The devil snatches the soul from his body with such anguish and tribulation that no one can know it except he who endures it, and all the talents and power and “knowledge and wisdom” (2 Chr. 1,12) which they thought they had will be taken away from them (cf. Lk. 8,18; Mk. 4,25), and they leave their goods to relatives and friends who take and divide them and say afterwards, “Cursed be his soul because he could have given us more, he could have acquired more than he did.” The worms eat up the body and so they have lost body and soul during this short earthly life and will go into the inferno where they will suffer torture without end. All those into whose hands this letter shall have come we ask in the charity that is God (cf. Jn. 4,16) to accept kindly and with divine love the fragrant words of our Lord Jesus Christ quoted above. And let those who do not know how to read have them read to them. And may they keep them in their mind and carry them out, in a holy manner to the end, because they are “spirit and life” (Jn. 6,64). And those who will not do this will have to render “an account on the day of judgement” (cf. Mt. 12,36) before the tribunal of our Lord Jesus Christ (cf. Rom. 14,10). 1. The Franciscan family, as one among many spiritual families raised up by the Holy Spirit in the Church2, unites all members of the people of God — laity, religious, and priests — who recognize that they are called to follow Christ in the footsteps of St. Francis of Assisi3. 3. The present rule, succeeding Memoriale Propositi (1221) and the rules approved by the Supreme Pontiffs Nicholas IV and Leo XIII, adapts the Secular Franciscan Order to the needs and expectations of the Holy Church in the conditions of changing times. Its interpretation belongs to the Holy See and its application will be made by the General Constitutions and particular statutes. 4. The rule and life of the Secular Franciscans is this: to observe the gospel of our Lord Jesus Christ by following the example of Saint Francis of Assisi, who made Christ the inspiration and the centre of his life with God and people. 5. Secular Franciscans, therefore, should seek to encounter the living and active person of Christ in their brothers and sisters, in Sacred Scripture, in the Church, and in liturgical activity. The faith of Saint Francis, who often said “I see nothing bodily of the Most High Son of God in this world except his most holy body and blood”, should be the inspiration and pattern of their Eucharistic life. 7. United by their vocation as “brothers and sisters of penance”10, and motivated by the dynamic power of the gospel, let them conform their thoughts and deeds to those of Christ by means of that radical interior change which the gospel itself calls “conversion”. Human frailty makes it necessary that this conversion be carried out daily. 10. Uniting themselves to the redemptive obedience of Jesus, who placed his will into the Father's hands, let them faithfully fulfil the duties proper to their various circumstances of life16. Let them also follow the poor and crucified Christ, witness to him even in difficulties and persecutions. 11. Trusting in the Father, Christ chose for himself and his mother a poor and humble life, even though he valued created things attentively and lovingly. Let the Secular Franciscans seek a proper spirit of detachment from temporal goods by simplifying their own material needs. Let them be mindful that according to the gospel they are stewards of the goods received for the benefit of God's children. Thus, in the spirit of “the Beatitudes”, and as pilgrims and strangers on their way to the home of the Father, they should strive to purify their hearts from every tendency and yearning for possession and power. 12. Witnessing to the good yet to come and obliged to acquire purity of heart because of the vocation they have embraced, they should set themselves free to love God and their brothers and sisters. 13. As the Father sees in every person the features of his Son, the firstborn of many brothers and sisters, so the Secular Franciscans with a gentle and courteous spirit accept all people as a gift of the Lord and an image of Christ. 14. Secular Franciscans, together with all people of good will, are called to build a more fraternal and evangelical world so that the kingdom of God may be brought about more effectively. Mindful that anyone “who follows Christ, the perfect man, becomes more of a man himself,” let them exercise their responsibilities competently in Christian spirit of service. 18. Moreover they should respect all creatures, animate and inanimate, which “bear the imprint of the Most High”, and they should strive to move from the temptation of exploiting creation to the Franciscan concept of universal kinship. ​Since they are immersed in the resurrection of Christ, which gives true meaning to Sister Death, let them serenely tend toward the ultimate encounter with the Father. 20. The Secular Franciscan Order is divided into fraternities of various levels — local, regional, national, and international. Each one has its own moral personality in the Church33. These various fraternities are co- ordinated and united according to the norm of this rule and of the constitutions. 21. On various levels, each fraternity is animated and guided by a council and minister (or president) who are elected by the professed according to the constitutions. Their service, which lasts for a definite period, is marked by a ready and willing spirit and is a duty of responsibility to each member and to the community. Admission into the Order is gradually attained through a time of initiation, a period of formation of at least one year, and profession of the rule. The entire community is engaged in this process of growth by its own manner of living. The age for profession and the distinctive Franciscan sign are regulated by the statutes38. Profession by its nature is a permanent commitment. 24. To foster communion among members, the council should organize regular and frequent meetings of the community as well as meeting with other Franciscan groups, especially with youth groups. It should adopt appropriate means for growth in Franciscan and ecclesial life and encourage everyone to a life of fraternity. This communion continues with deceased brothers and sisters through prayer for them. 26. As a concrete sign of communion and co-responsibility, the councils on various levels, in keeping with the constitutions, shall ask for suitable and well-prepared religious for spiritual assistance. They should make this request to the superiors of the four religious Franciscan families, to whom the Secular Fraternity has been united for centuries.